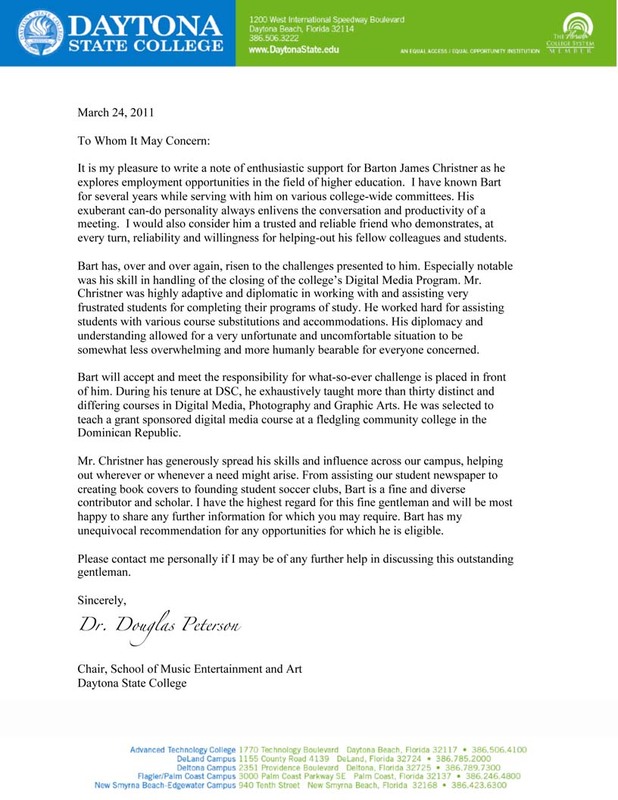 It is my pleasure to write a note of enthusiastic support for Barton James Christner as he explores employment opportunities in the field of higher education. I have known Bart for several years while serving with him on various college-wide committees. His exuberant can-do personality always enlivens the conversation and productivity of a meeting. I would also consider him a trusted and reliable friend who demonstrates, at every turn, reliability and willingness for helping-out his fellow colleagues and students. Bart has, over and over again, risen to the challenges presented to him. Especially notable was his skill in handling of the closing of the college’s Digital Media Program. Mr. Christner was highly adaptive and diplomatic in working with and assisting very frustrated students for completing their programs of study. He worked hard for assisting students with various course substitutions and accommodations. His diplomacy and understanding allowed for a very unfortunate and uncomfortable situation to be somewhat less overwhelming and more humanly bearable for everyone concerned. Bart will accept and meet the responsibility for what-so-ever challenge is placed in front of him. During his tenure at DSC, he exhaustively taught more than thirty distinct and differing courses in Digital Media, Photography and Graphic Arts. He was selected to teach a grant sponsored digital media course at a fledgling community college in the Dominican Republic. Mr. Christner has generously spread his skills and influence across our campus, helping out wherever or whenever a need might arise. From assisting our student newspaper to creating book covers to founding student soccer clubs, Bart is a fine and diverse contributor and scholar. I have the highest regard for this fine gentleman and will be most happy to share any further information for which you may require. Bart has my unequivocal recommendation for any opportunities for which he is eligible. Please contact me personally if I may be of any further help in discussing this outstanding gentleman.